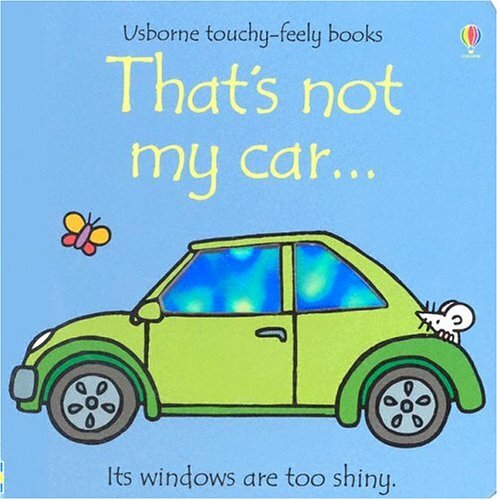 For this, the first edition of my Sunday Morning Book Review, I have chosen a tome entitled: “That’s not my car…”, by Fiona Watt & Rachel Wells. Over the last month or two I have, on a couple of occasions, misidentified my car in the parking lot when getting home from work and was left wondering if there was something wrong with me. After searching the internet for a pill that would fix this problem and finding none that didn’t include vomiting, loss of eyesight and death as possible side effects I decided to search for a self-help book. This, of course, is when I stumbled upon the book, “That’s not my car…” the subject of this review. Judging the book by its title, I ordered a copy immediately and have spent the last week and a half reading it cover to cover. The premise of the book is that by identifying a certain part of you car and memorizing how it feels when you touch it you will no longer have to live in fear of walking up to the wrong car in a parking lot. While, the subject matter was something that I could relate to and has, in fact helped me with this issue (I chose the hood of our van as my car-feel identifier), the use of a mouse as the main character, I thought was a bit stereotypical and somewhat offensive (just because the Three Blind Mice are the most well known and celebrated mice in history doesn’t mean that all mice have sight problems). In addition, the mouse’s character was obscenely underdeveloped, to the point where it would be impossible for someone who doesn’t have Mis-Identified Car Disorder (MICD) to understand what the poor mouse is going through. At any rate, if you or someone you know suffers from MICD please ask your local bookseller to see if, “That’s not my car…” would be right for you.